Real Ale: To score highly in this category a pub needs to have a good range of real ales as well as providing unusual ales. The quality of the ale will also affect the score given. The range of lager, stout or wine will not affect this score, this category is purely for assessing hand pump ales. Character: This relates to the actual pub building. A traditional old fashioned pub with exposed beams, real fire, original chimneys, old photographs on the walls, etc will score highly. Pubs that are very modern are likely to score low marks. Atmosphere: This category is rather subjective. It is an assessment on whether a pub is friendly, relaxing, lively. Things that would add to a good score are feeling comfortable and relaxed, good friendly welcoming bar staff. A lively pub will get a good rating if everyone is having a good time and enjoying themselves. A low score here will be given if you feel uncomfortable in a pub, maybe because it's too quiet and empty or maybe because other drinkers are rowdy and/or threatening or the music is too loud. Trendy: This is a rating according to how fashionable a pub is. Is it the sort of pub that you want to take your mates along to on a Friday or Saturday night? A low or average score here does not mean the pub is disappointing, it simply might be a little quiet sometimes. 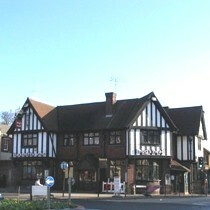 Large corner pub on Sandridge Road. Good mix of drinkers. Three or more real ales. Popular for food.